If it were up to Matt, I’d make chocolate chip cookies every time we had small groups. 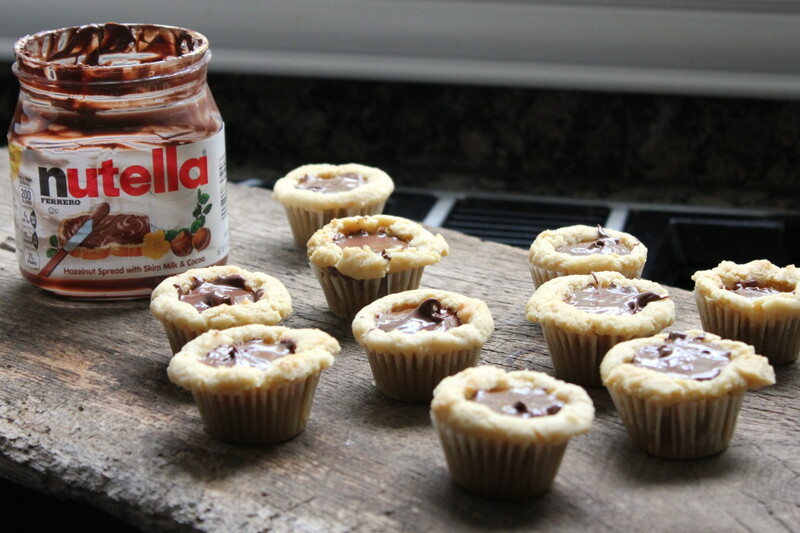 But I get sick of making the same thing over and over again, and so I wanted to try out these Nutella cookie cups. My friend Julie made them a few months back for a work luncheon and they were a huge hit! There’s just something magical about that delicious chocolate hazelnut spread. With only a handful of ingredients: skim milk, cocoa and hazelnuts, the unique taste of Nutella is something to rave about. From cookies and toast to apples and ice cream, you can put Nutella on just about anything! 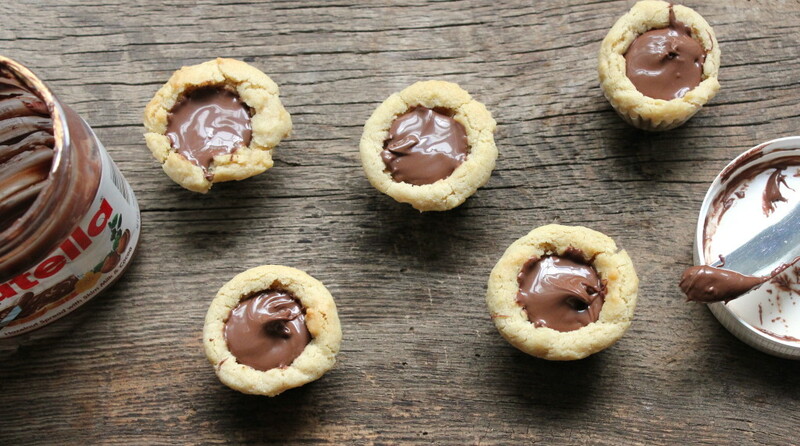 These cookie cups are surprisingly easy to make. 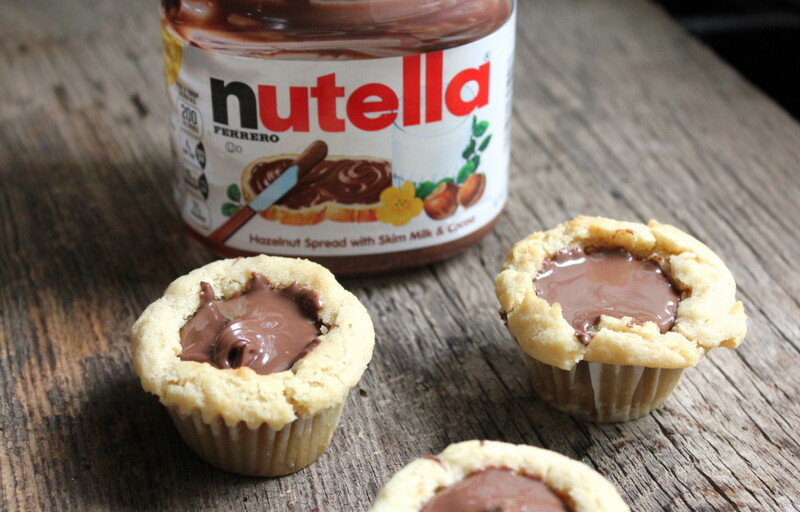 All you need is your favorite sugar cookie dough recipe, jar of Nutella, and a mini muffin pan. I used this M&M cookie dough recipe and left out the M&Ms. It might be worth it to add mini chocolate chips to the cookie dough cups to make them extra chocolatey! What did Matt think? He said they were terrible, but that’s because he didn’t know how to peel of the paper muffin liners completely! These little suckers are rich, but not too rich. The chocolate hazelnut spread adds a nice sweetness that is not nearly as overpowering as a scoop of straight chocolate. I’ll definitely be making these again. Enjoy and good luck eating just one! Preheat oven to 350 degrees F. Grease a mini muffin pan or line with paper muffin cups. In bowl of a stand mixer fitted with a paddle attachment, combine the butter, sugars, egg, vanilla and beat on medium-high speed until well-creamed, light and fluffy, about 5 minutes. Scrape down the sides of the bowl and add the flour, cornstarch, baking soda and salt and mix until just combined, about 1 minute. Roll dough into balls about 1.5 inches thick (or you can use an ice cream scoop), and place into the mini muffin tin. Bake for 12-15 minutes, until golden brown but not too dark around the edges. When done, remove from oven and let sit for about 2 minutes. Then make wells for the Nutella with a shot glass or similar object. Add 1 tablespoon Nutella to each cup. Let cool 15-20 minutes in tin. Remove from tin and enjoy. Nutella will solidify in about an hour, which makes them safe to transport. 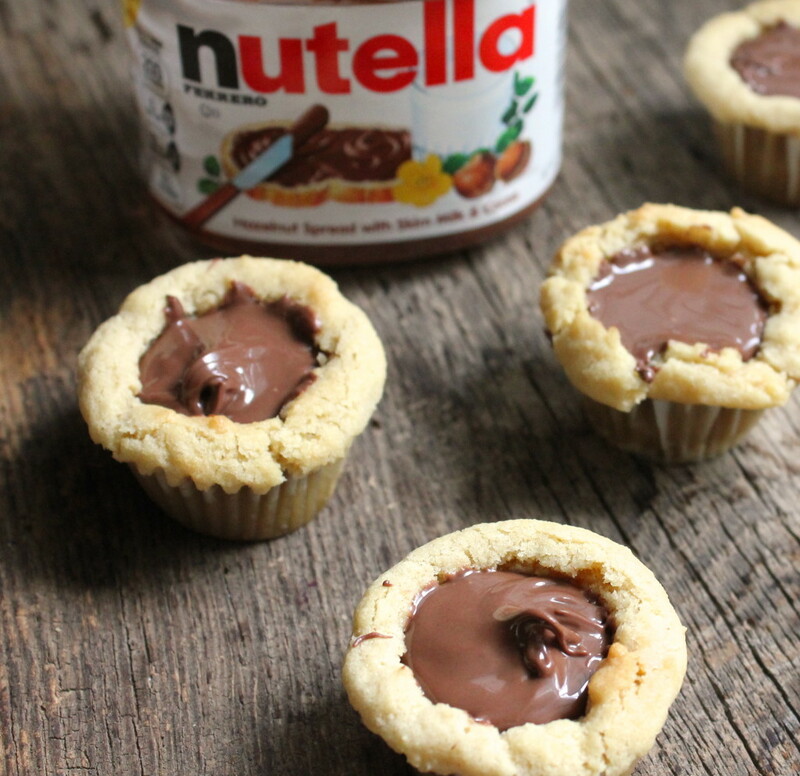 7 Responses to "Nutella Cookie Cups"
They look really good! I was not a fan of Nutella until you made those delicious brownies with it. I bet I would like these. That was vey funny about Matt not getting off the paper liners! You know he is so smart! Did Matt go to A&M? Love Nutella, what a cute and yummy idea! These remind me of treat my mom used to make me as a kid that involved Reese’s mini cups!